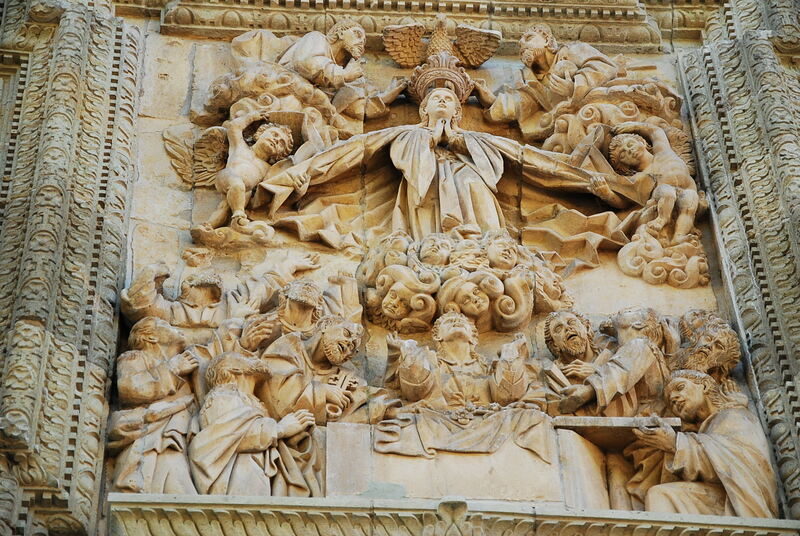 You have GOT to do this walking tour of Oaxaca’s great churches with Linda Martin. She is funny, zany, creative, irreverent and informative. She has a historical perspective on the history of Oaxaca and Mexico that will leave you chuckling. 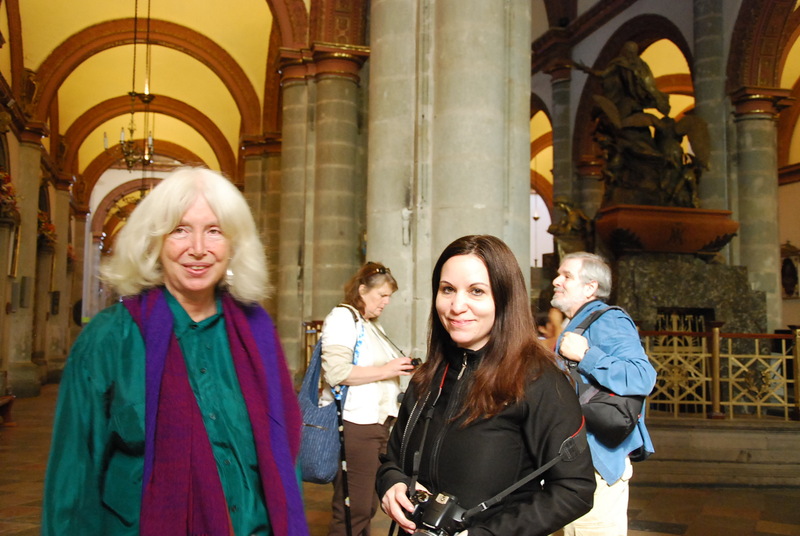 You can meet Linda at 10 a.m. every Tuesday and Saturday in front of the Catedral (that’s the major church on the Zocalo). 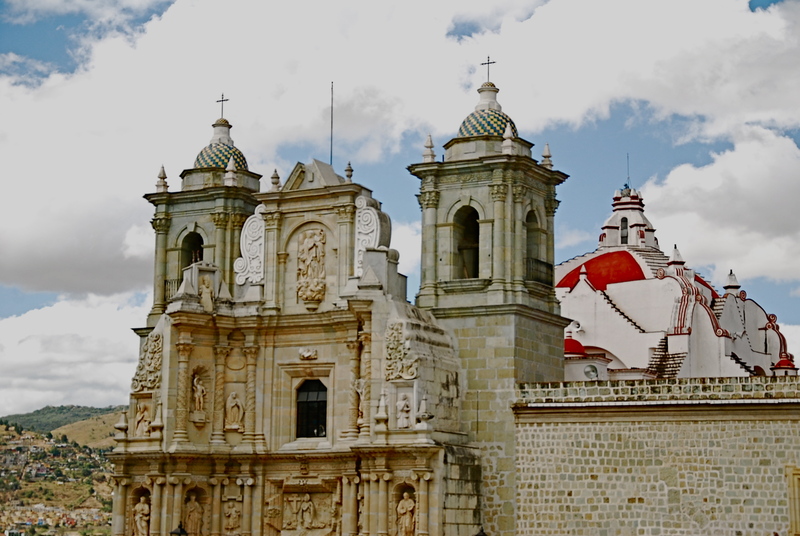 As Linda says, it is not Oaxaca’s most beautiful or ornately adorned religious edifice, but it was the home church of the bishop of Oaxaca, so has a very important place in the history of the city. We were armed with our cameras and Linda was most patient with us as we gathered around to hear the stories of saints, sinners, the conversion of the indigenous, and tales of war and rebellion. She took her time to answer questions and wait for the stragglers who were busy “shooting” images of virgins, cherubs, stained glass, altars and supplicants carved from wood centuries ago. You could visit these churches on your own, but it would just not be as rich or rewarding an experience. 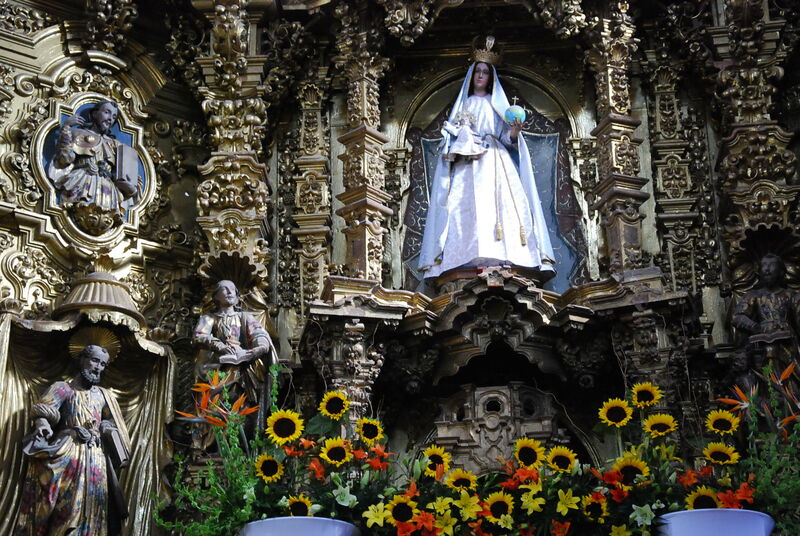 The Virgin of Solitude (La Nuestra Senora de la Soledad) is Oaxaca’s patron saint. 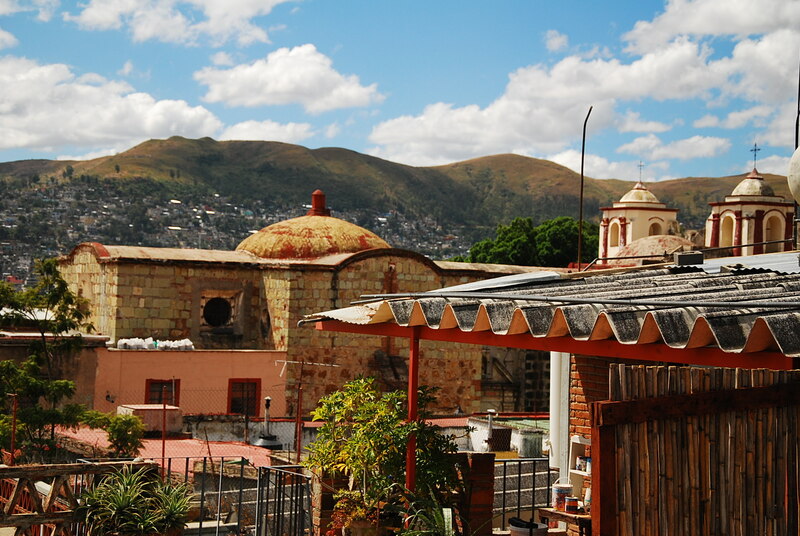 It is considered to be Oaxaca’s holiest site, built between 1682 and 1690. We came upon a family getting ready for a quinciniera, the 15th birthday celebration of teenage girls to welcome them into adulthood. During the two hour walking tour, we climbed stairs, traversed hills on narrow streets, visited four churches (Catedral, La Compania de Jesus, San Felipe Neri, and Basilica de la Soledad), plus historical and whimsical sights along the way, and wound up at her home where we had the opportunity to see her wonderful paintings (Linda is an accomplished artist), and make our 100 peso per person donation to help support Estancia which offers a bed and meals to those accompanying a loved one on a Oaxaca hospital stay. Along the way, we visited a religious reliquary shop that was doing a lively business selling home altar decor for Day of the Dead. 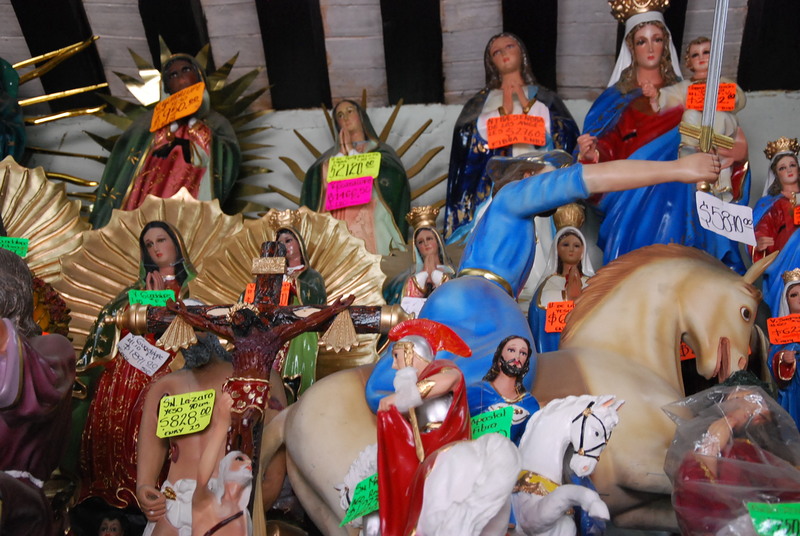 The choices were seemingly infinite as we passed through displays of infant to adult sized Jesus, the Virgins of Guadelupe, Soledad and Juquila, and stacks of musc CDs and other religious and mood necessities. This entry was posted in Cultural Commentary, Oaxaca Mexico art and culture, Oaxaca travel, Travel & Tourism and tagged Basilica de la Soledad, Cathedral of Oaxaca, church walking tour, Linda Martin, Oaxaca, San Felipe Neri, walking tour Oaxaca. Bookmark the permalink.